Review Standard contact lens case Could do with colouring either the left or the right container as they are both white. This would be easier for recognition when using lenses everyday. This standard contact lens case available via Vision Direct is a generic product that has been produced for use with all varieties and brands of contact lenses. Almost all contact lens varieties require that they be regularly bathed in cleaning fluid and thoroughly disinfected. This prevents eye infections that can complicate vision, and prevents the build-up of deposits of dust and dirt. This can also lead to infections, and can contribute to blurred vision. So having an appropriate contact lens case is vital to maintaining the quality of whatever lenses you require. 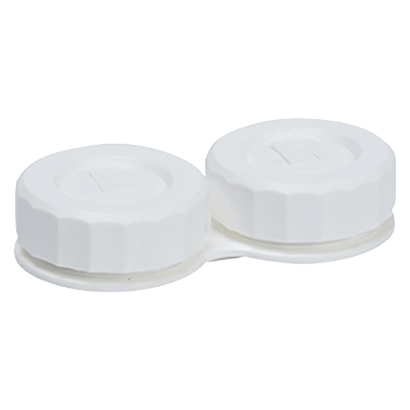 • The standard contact lens case has been engineered for use with every kind of contact lens available, and anyone who uses contacts should have a few cases to spare for when they urgently need to clean their lenses. • The standard contact lens case is made from a specially chosen plastic polymer, with extra strength and flexibility to protect lenses when they are being cleaned. It is small and easy to store away at night when lenses are not being worn. • Cases are vital because contact lens wearers need to regularly clean and replace their lenses. Other vessels could be used to clean lenses, but it is advisable to use the standard case as it has been produced to snap shut securely and to the right specifications for holding all lens varieties.